In Belize, there’s a river called the Sittee River. It is a body of brackish water that is surrounded by giant mangroves and, at night, total darkness. I mean total darkness. Suddenly, our small boat turns into the mangroves, thick and spooky in the tiny flashlights. It reaches the Anderson Lagoon. You see nothing until the boat speeds up, and then you see it: “burning wata”, as the Belizeans call it. 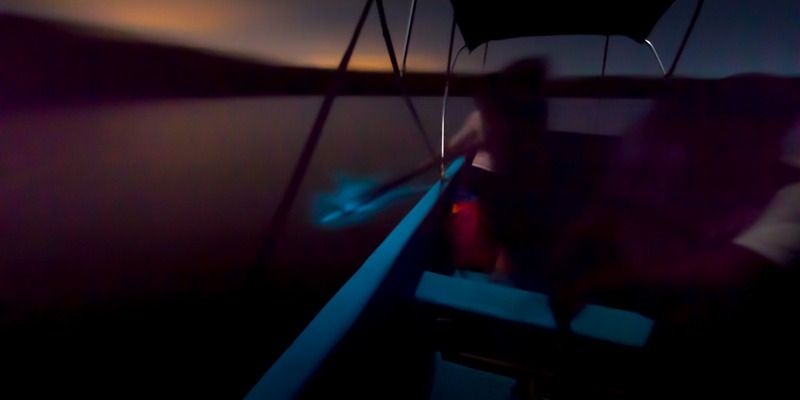 Blue, eerie lights glow in the wake of the boat, or around your hand if you stick it into the dark water: bioluminescence. Fantastic nocturnal magic.